Dedication of Founders Hall and Celebration of the Arlington Campus with a special guest speaker. Invitation to the dedication of Founders Hall on the Arlington Campus on Thursday, March 8, 2012. 5" x 7"; color. Four pages (three pages of content). Invitation to the dedication of the Donald and Nancy de Laski Performing Arts Building on the Fairfax Campus on Tuesday, September 21, 2010. 5" x 7"; color. Four pages (three pages of content). 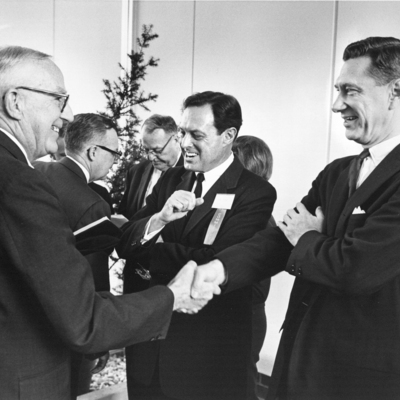 Reception, George Mason College Dedication, Fairfax, Va., November 12, 1964. Speakers platform, George Mason College Dedication, Fairfax, Va., November 12, 1964. 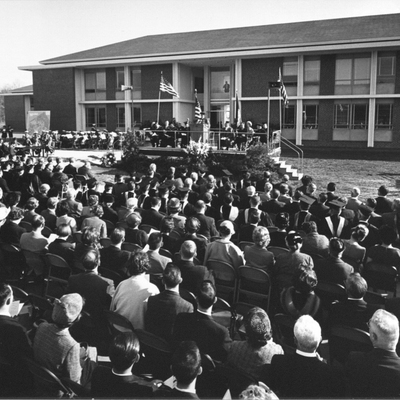 Photograph by Oliver Atkins of the George Mason College Dedication, November 12, 1964 from the perspective of the audience. Building in the background is the North Building (now named the Finley Building). The Gunston Ledger, Volume 2, Number 1 October 1964. 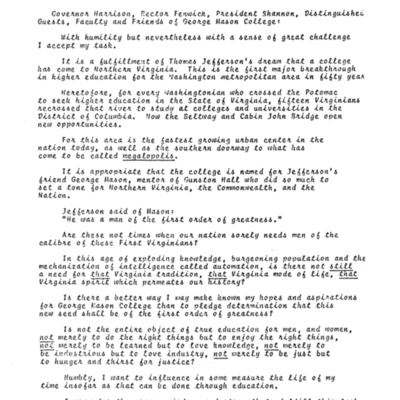 Remarks by Dr. Robert H. Reid, director, George Mason College, November 12, 1964. Robert H. Reid speaking at George Mason College Dedication, Fairfax, Va., November 12, 1964. 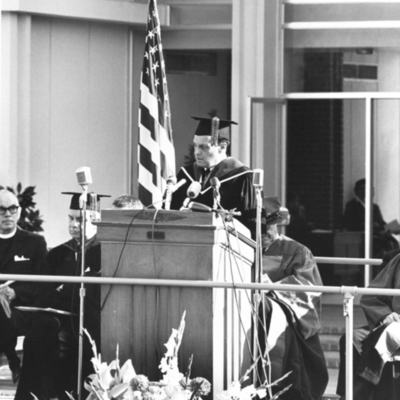 Photograph by Oliver Atkins of director, Robert H. Reid addressing the George Mason College Dedication, November 12, 1964. Directly behind him is the North Building (now named the Finley Building).